The European Commission introduced Directive 2003/102/EC relating to the protection of pedestrians and other vulnerable road users before and in the event of a collision with a motor vehicle. Pedestrians, of course, do not have an “impact-absorbing zone”, so in the future the vehicles will have to absorb the impact energy. 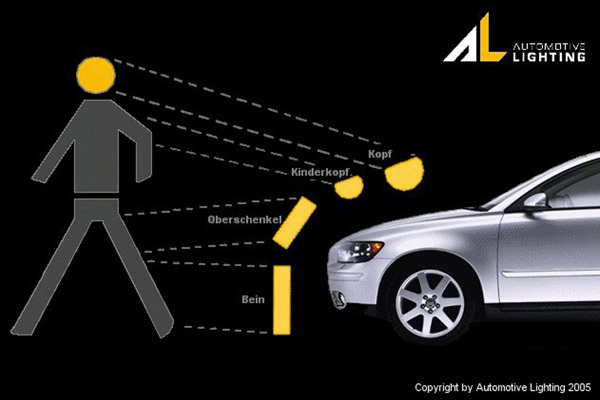 In other words, the front of the vehicle must become “soft” enough to protect pedestrians from serious injuries. Depending on vehicle category and front design, the headlamps are located near or in the impact area of the thigh, of the leg or of a child’s head. Headlamps have to absorb the impact energy in a pre-defined manner along with the surrounding elements, while the load peaks caused by internal collisions must be avoided. Moreover, headlamps should not cause additional injuries from splinters or fragments. Automotive Lighting owns crash-test equipment with which to carry out important preliminary checks using complete headlamps. Tests can be carried out with various impactors, and impacts can be simulated through CAD. Since “pedestrian protection” goes well beyond the headlamp, Automotive Lighting conducts research in cooperation with external institutes and European carmakers in order to optimize test results.